Posted November 1, 2014 by Leann Richards & filed under Exhibitions. Shazia Imran’s Reveal, takes well-known urban images and turns them into brief glimpses of the light beneath their skin. 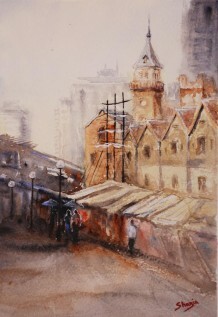 The artist describes herself as a self-taught impressionist and the influence of the movement is evident in her technique and medium. These water colours are unique perspectives on well-known environments. This is particularly true of the Sydney pieces which eschew the conventional use of brilliant colours. In Sydney, 2014, the artist portrays a slice of street life in the grey mists of dawn. The shining reds of cars and traffic signals loom in the blackness, while the straightedged architecture forms a sharp cage seeking to capture the reflected gleam. It is an unusual and playful look at a familiar scene. These paintings are commercial, decorative and thoughtful. The artist’s vision of archetypal places provokes a knowing nod of recognition while simultaneously acknowledging the contradictions within.